Send custom made HTML email templates using the JangoMail email marketing platform. Sign in to your JangoMail account and create a new email. Locate the content.html file in the HTML export folder. Right click the file, and open it with a text editor. Copy the entire code and paste it into the code editor to upload your newsletter. You can now use your Mail Designer 365 HTML design with the automation tools provided in the JangoMail platform. 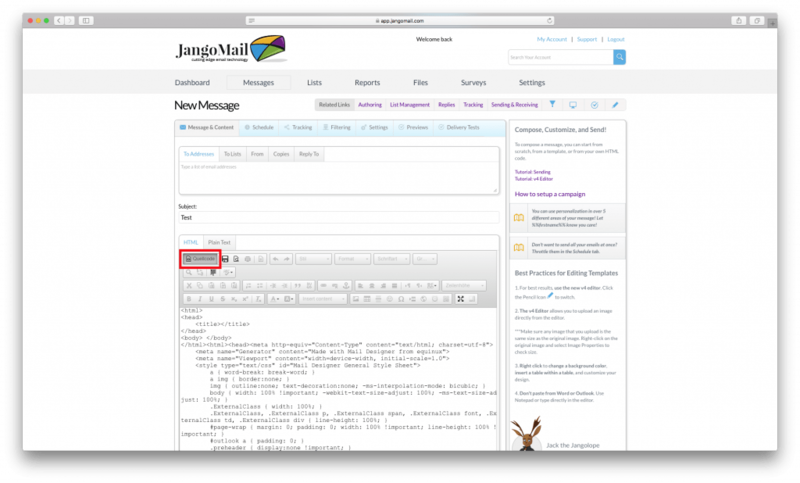 Use your HTML email design with the JangoMail platform. Our team is always on hand ready to give you support. If you have specific questions regarding HTML export to JangoMail, or just need some extra help getting set up, get in touch! Mail Designer 365 helps you create stylish, professional HTML emails on your Mac to use with JangoMail. Download for free to see what you can achieve.